These steps apply to Ubuntu Linux only. If you are using some other flavor of Linux, get help from a TA. You will need sudo access in order to complete these directions (The first user account has this by default). Open a terminal (Applications > Accessories > Terminal). You may want to right-click on the terminal icon and select "Add to panel" so the icon will appear next to the default help and Firefox icons in the top panel. 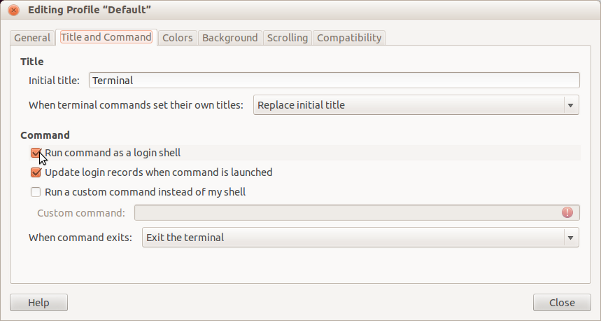 If you're using Ubuntu 12.04, Ubuntu 14.04 or the latest version of Mint, ensure that the Run command as login shell option is checked under the Title and Command tab in Profile Preferences (located in Terminal's Edit menu). After changing this setting, you may need to exit your console session and start a new one before the changes take effect. This will download and install RVM. You might see an error like "GPG signature verification failed"
gpg --keyserver hkp://keys.gnupg.net --recv-keys 409B6B1796C275462A1703113804BB82D39DC0E3"
Every time you open a new terminal window, rvm will be active inside it. Close your terminal window and open a new one. This downloads and compiles Ruby, which takes a while. Using a terminal again, execute the following command to install rails. If you don't have a preferred code editor, you can install Atom. Checkout this section of the Atom manual for the latest instructions.